A few weeks ago, a fellow Cooper (Portfolio and Project Management SME) and I (Enterprise Architect) were enjoying some good, Cooper-colloquy regarding the role that data and information play in organizational strategy. The following day, he forwarded me an invite to participate in a LinkedIn group discussion. The discussion started with one of the participants stating that Enterprise Architects need to have a better appreciation for the value and importance of information in regards to strategic transformation. Being that we currently are living in the “Information Age”, I agreed with the statement and from there the discussion evolved into a debate of how important information actually is in the successful design, implementation, and execution of a strategy and why. For many years, People, Process, and Technology have been recognized as the three components of a successful business strategy, but today’s information driven environment impels us to consider INFORMATION as the fourth component of a successful strategy. Regardless of the industry, the abundance of information that is generated in today’s cyber environment and the requirements for processing, sharing, storing, securing, and displaying information emphasizes the vital role that information plays in achieving success. Add to that – the dependency that leaders have on accurate, relevant, and timely information to make data driven decisions regarding the current and future goals of their organizations. It’s hard to argue the fact that information has become not only a valuable corporate asset, but the fourth component of a successful business strategy. 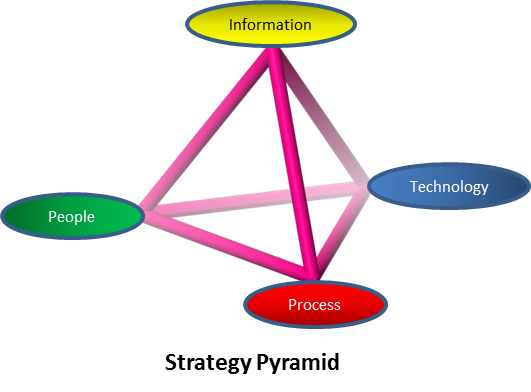 What has been the People, Process, and Technology strategy triangle is now the People, Process, Technology, and Information strategy pyramid. Implementing a successful business strategy in today’s competitive global environment requires a holistic understanding of the enterprise and how the four components of the Strategy Pyramid interact to achieve strategic value. Additionally, based on the indisputable impact that accurate, relevant, and timely information has on success, it is imperative that information management requirements be a priority throughout the strategic planning and design process. Learn more about our Strategy & Decision Support Practice.